The Kinnaird Hall in Bank Street, on a site made available by Lord Kinnaird, accommodated 2,500 people including a gallery and a multitude of coats-of-arms. It was designed by architect Charles Edward and started life as the new Corn Exchange, but a number of concerts starting in its year of opening 1858, two years after the city`s Bubble Hall had been demolished, would prove its worth as a public hall. Farmers used the space for corn exchange from 1861 and found, very soon, a better purpose was that of a public hall. Arthur Lloyd is known to have performed at the New Corn Exchange on Tuesday the 8th of April 1862, see add below. An organ was installed in 1865 and the building changed its name to the Kinnaird Hall. It was owned for 60 years by The Dundee Corn Exchange and Public Hall Association Ltd and provided one of the city`s major venues for meetings, bazaars, soirees, converzatione, concerts, lectures and theatrical entertainments which included William McFarland`s presentations of dioramas and variety nights in the 1870s. There were also exhibitions, and boxing contests. Orchestral concerts included the Glasgow Orchestra conducted by Arthur Sullivan in 1876. Musical Festivals were started and choral concerts, which included Dundee Choral Union being conducted by (Sir) Alexander Mackenzie. Military bands frequently came from America, long before John Philip Sousa. Concert pianists include Anton Rubinstein, Dr Albert Lamond and Paderewski; opera stars included Madame Blanche Marchesi and Durward Lely. Pantomime was staged, and in variety the comedian W.F. Frame topped the bill. W.F. 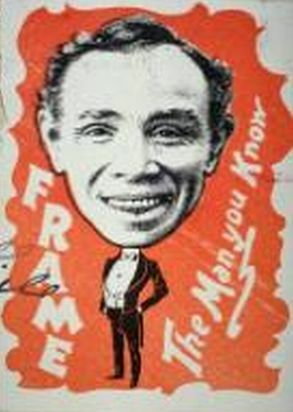 Frame was a founder of today`s Scottish Showbusiness Benevolent Fund. Right - A Poster for 'W. F. Frame - The Man You Know' - Courtesy Graeme Smith. It added animated pictures from 1902 and larger programmes of cine-variety from around 1907. In 1919 it was sold, aware of the start of the building of the city`s Caird Hall, and became a full time cinema, the Kinnaird Picture House, after alterations seating 1,500 people, and advertising itself as Dundee`s Leading Cinema. It continued to be well promoted and closed finally in the 1960s and was subsequently demolished. A street photograph of its exterior can be seen here. The above information on the Kinnaird Hall, Dundee was written for this site by Graeme Smith in February 2013. Mr W G Ross, the Glasgow and London great comic. Mr Arthur Lloyd, the unparalleled Comique Favourite of Glasgow, Edinburgh and Belfast, etc. Mrs Jackson, the eminent Scotch and Irish ballad singer. Miss Ada Taylor from the Theatre Royal, Glasgow. Mr Frank Saddler, tenor, from the City Hall Concerts, Glasgow. and other talented Artistes - Mr Mordaunt Taylor, pianist.